Immigrant Trail reconstruction is, officially, underway. Parts of the Immigrant trail were lost in July, 2007, due to massive rainfall over a short period of time. Rock slides and soil slides closed the trail. Since then, many trees have fallen over the trail. Trail reconstruction has begun on the lower end of Wagon Road Trail. An official opening date for the trail has not been determined. 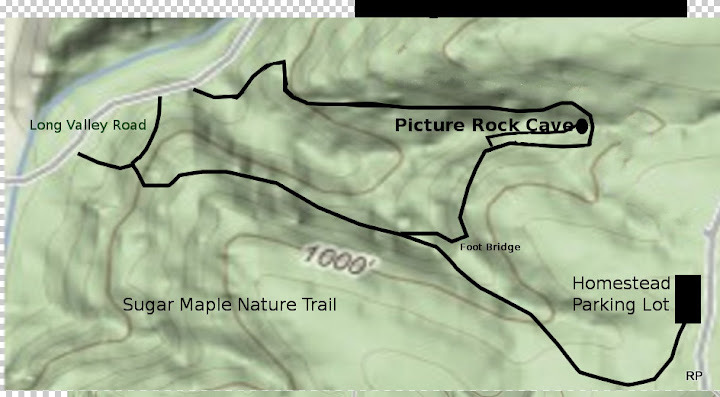 The striped line on the above map, shows the intended trail route. The red striped line shows the part of the trail that has been roughed in. The black stripe shows the intended route. Officially, the trail is NOT open for hiking. It is NOT an official park trail. It is NOT safe to walk. There are many overhanging trees. The trail still has rough rock paths in places. Construction crews are sawing trees. Visitors could be issued tickets by park rangers. Immigrant Trail heading west along Wis R.
For those that are familiar with this trail prior to 2007, the reconstructed trail will follow the old trail bed. The trail will be an extension of the Wagon Trail on the east, almost going to Walnut Eddy, then heading west along the Wisconsin River valley. At the west end, it will join with the old Indian trail and, most likely join with Sentinel Ridge Trail. Along the reconstruction, old signs still mark the old trails. These signs will be removed prior to trail opening. 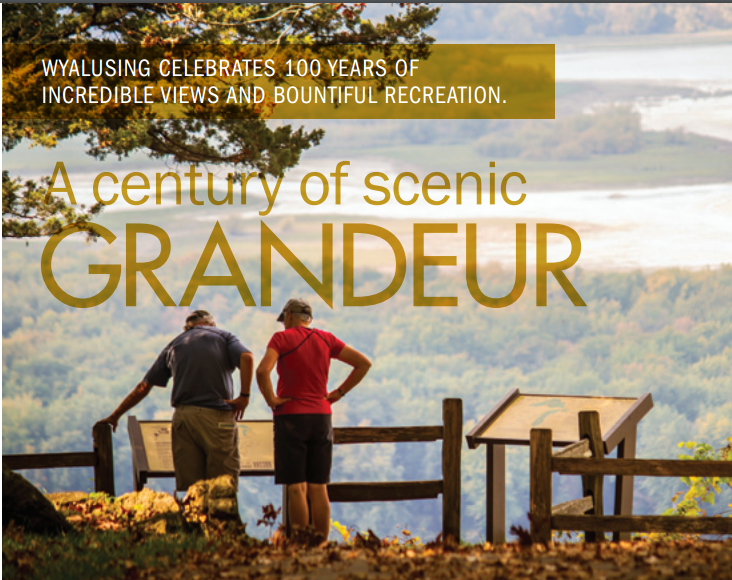 The reopening of Immigrant Trail is welcomed by many hikers who enjoy the solitude of a walk along the Wisconsin River. Birders will greet the opening of this trail with smiles - binoculars focused on areas where at least a half dozen rare and unusual birds make their home. Historians will recall the days of wagons full of supplies with pioneers heading to the west. The next few blogs will show the progress of the trail reconstruction. To view Immigrant Trail reconstruction photos, click here. Do you have a favorite photo of Immigrant Trail? Maybe you have a short story about the trail. How about sharing? Click here.